I decided since last week, I only did yoga, this week I would just run-walk and skip yoga. The two hours back to back does get a little overwhelming and I was already hungry for lunch, so I went ahead and came back. Today, we did 3 minutes of running + 4 minutes of walking for a little over 30 minutes. I felt pretty good, like I might be able to bump up to 4 minutes of running and more before long. I haven’t had any knee pain yet, so I’m hoping it stays that way. I will be icing them when I get home (kinda hard to do at work). I’m seriously considering taking some glucosamine or another supplement for my joints. What do you guys think? 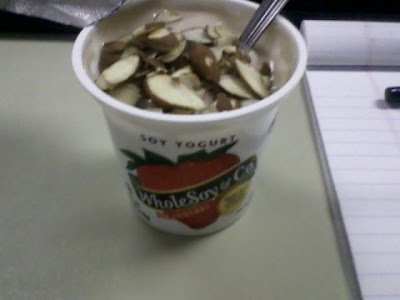 Before I left for my workout, I had a Whole Soy & Co strawberry soy yogurt (the last one in my fridge) that I topped with a tbsp of sliced almonds. I’m hoping the protein will offset the massive amount of sugar in the yogurt. I won’t be buying this kind again for a while. I think I’m going to stick to plain nonfat and then just add my own stuff in. 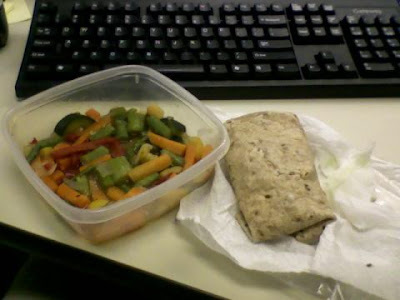 Lunch was sort of thrown together at the last minute this morning but wound up being pretty tasty! 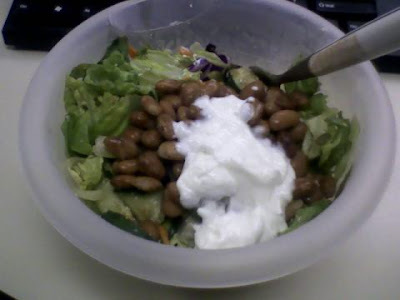 It’s a big ol’ salad of romaine lettuce mix (romaine, red cabbage, carrots), half a cucumber chopped, 1 tbsp sunflower kernels, 1 tbsp pumpkin seeds, a few sprinkles of parmesan cheese, balsamic vinaigrette spray dressing, 1/2 cup pinto beans, and finally 2 tbsp fat free sour cream on top. 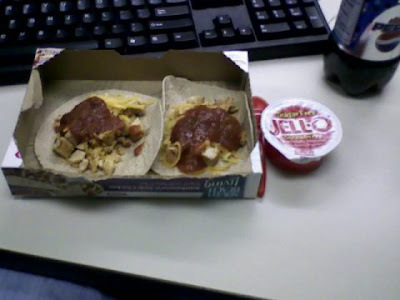 It was really great and filling! Good news! Fall is coming back this weekend, hooray 🙂 Today it is going to be in the low 60’s but still rather cold tonight. Luckily for the little kiddos trick or treating tomorrow, the weather should be quite pleasant in the 70’s during the daytime and hopefully 50’s-60’s during primetime. 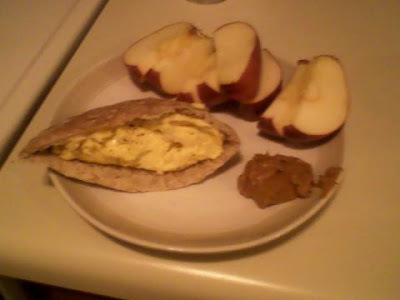 Today’s breakfast was rather simple…a container of Break Free egg substitute cooked in the microwave (with S+P) and stuffed into a whole wheat pita pocket. 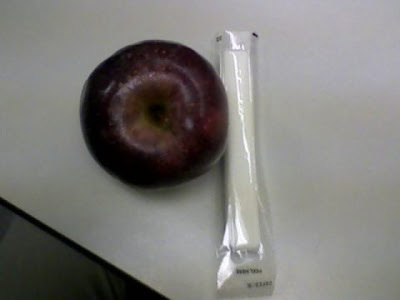 I also had a HUGE red delicious apple with 1 tbsp of peanut butter. Good call on changing the upper body workout yesterday…I am feeling it now! Actually, I woke up around 5 this morning with some weird back pain. I’m thinking it was just a cramp because it went away and I went back to sleep for my usual 45 minutes before the alarm went off. 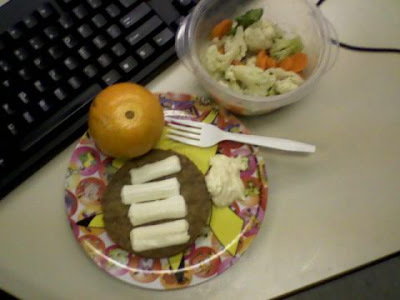 For lunch yesterday, I made a Boca original vegan burger and topped it with a light mozzarella string cheese and some Smart Balance mayo on the side. 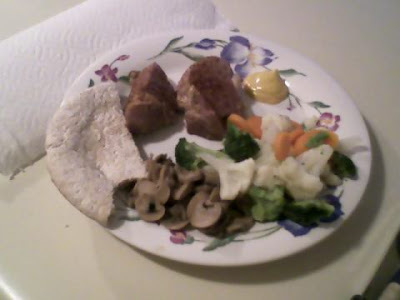 I also had some leftover Pictsweet veggies (cauliflower, broccoli, carrots) and a tangerine. 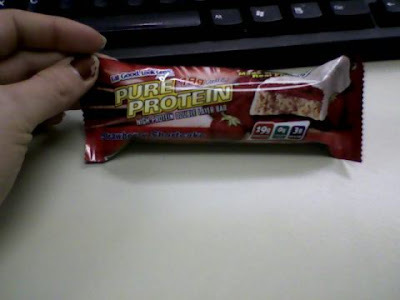 And now to the highlight of my day…trying another new flavor of Pure Protein bar! This time, it was the Strawberry Shortcake flavor, which was very similar to the Blueberry Crumbcake with it’s layer of fruitiness and outer coating. 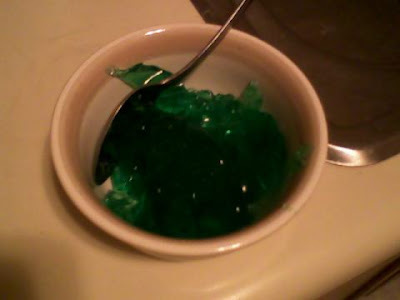 It tasted very sweet, but not so much that it overwhelmed me. We had our usual girl’s night potluck and this week, we had a repeat of “bean loaf” (vegetarian meat loaf made with different types of beans) and it was very moist and tasty, especially with a little squirt of ketchup on top. 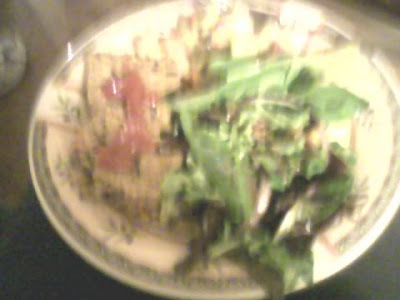 On the side, we had a nice salad of mixed greens (including some arugula!) with some red onion, mandarin oranges and chopped pears mixed in and a homemade dressing on the side, plus some mixed vegetables in a light cheese sauce. It was perfect! 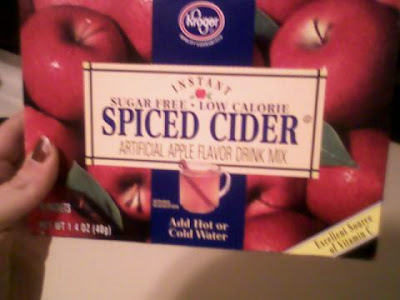 Dessert was my contribution this week and to be festive, I brought some sugar free Spiced Cider from Kroger. It’s only 10 calories for a packet and it’s quite good, especially if you like cider this time of year but can’t handle the heavy sugariness of regular! 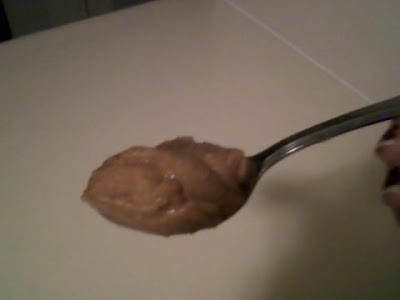 When I got home a couple of hours later, my tummy was rumbly, so I had a spoonful of peanut butter, then went upstairs to brush my teeth and read some more Women’s Health in bed before I decided to have another spoon, hah! Be back later, happy Thursday! Hope everyone’s day is going well…it seems that a lot of us have been stressed out or down lately. I think that comes with the changing of the seasons, on top of our busy schedules and everything else we have going on. Let’s continue to support each other and we’ll get through it! 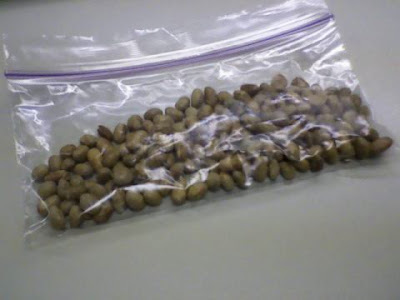 Mid-morning, after having just 1 cup of coffee with equal and milk (weigh in day, haha), I had some soynuts to fuel my workout. 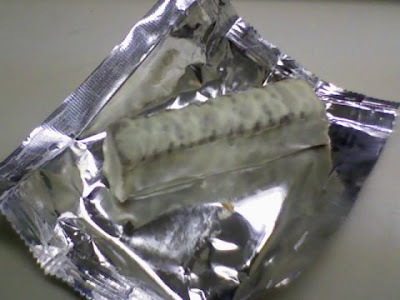 Once again, I was not thrilled about having this as a snack (don’t know why, I guess it’s just not as exciting as a fruity protein bar), but it proved me wrong again. It gave me quite a boost and kept me full the rest of the morning and through my workout. 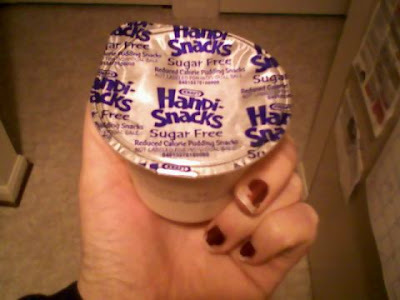 Just 3 tbsp worth…130 calories. I did another upper body workout today, but after not feeling much after the one I did on Monday, I decided to try some new moves today! I went in for my weekly Wednesday weigh-in today (say that 5 times really fast) and got more good news. Down almost another pound this week! I really feel like getting my portions in check, creating a better balance between food groups, and of course my recent addition of regular weight training has helped boost me tremendously. I couldn’t be happier right now. 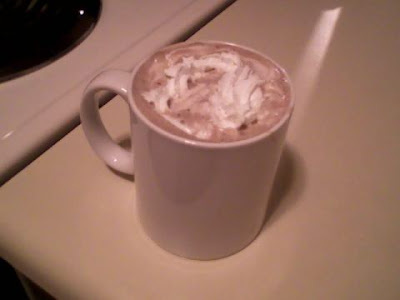 I used up the rest of my pumpkin (and skim milk) by making this, which always makes me feel good because it means nothing gets wasted. 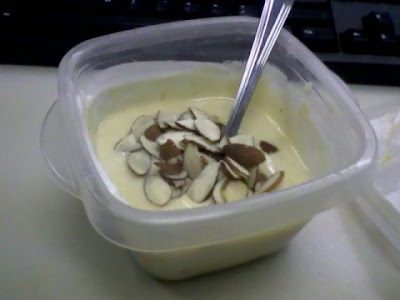 I also used 1 tbsp of sliced almonds instead of walnuts because I am all out of those too! 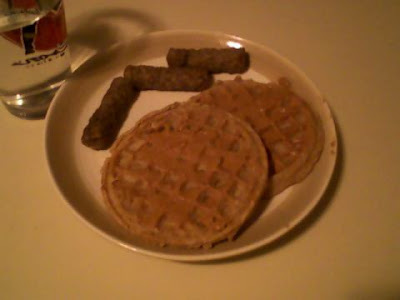 That breakfast of waffles with PB and turkey sausage held me so incredibly well! 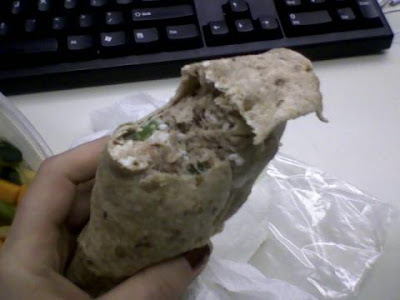 I was not starving when I ate this snack (well after my ‘normal’ snack time) but I knew I needed fuel for the gym, so I enjoyed it nonetheless! The order they are listed is not the order I completed them in. I actually did the Leg curls before the leg extensions and I think this helped me complete the sets before fatigue much better because I am weaker on that machine. I also had to jump around because the gym was quite busy, so I had to take whatever machine was available at the time. 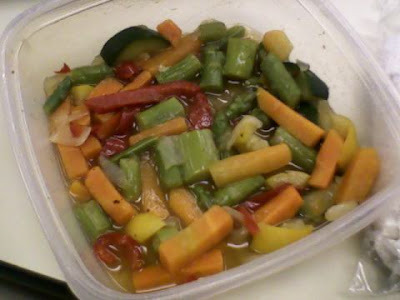 Close up of the veggies, I really liked this mix! This is one of those times when, if you really wanted something, you should’ve just had that first and avoided the other stuff. 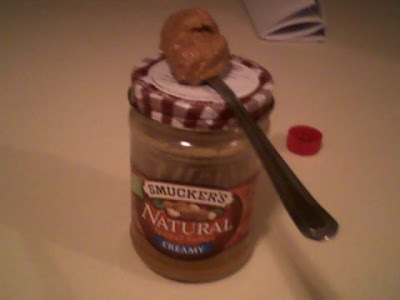 I was really craving peanut butter, so I had a spoon. And a half. Then went promptly to brush my teeth and go to bed early 🙂 While laying in bed, I iced my right knee (which was strange because it’s usually my left) because I was experiencing some discomfort — it did the trick though. 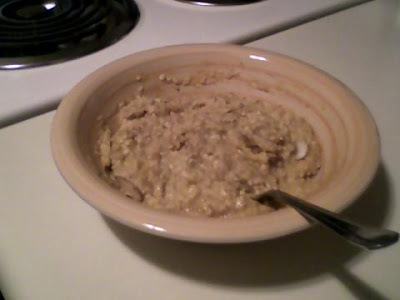 I have had oatmeal a few times and today I had Kashi waffles for breakfast. I’ve added a tortilla or pita pocket here and there. I’ve had a sweet potato and carrots a couple of times. 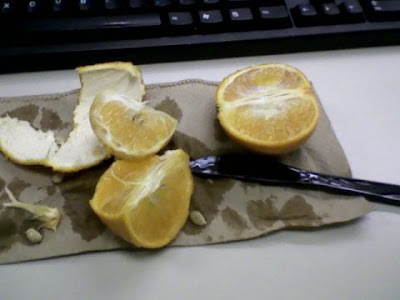 I’ve had at least once piece of fruit every day, such as an apple, tangerine, strawberries or cranberries. The past couple of days, I have bumped this up to 2, but have been careful to pair the fruit with a protein source as well. This has helped tremendously. All the while, I am still eating a wide variety and plenty of veggies, nuts, meat, lowfat dairy, eggs (or substitute), and keeping desserts light and low-sugar. I have had a hard time finding yogurt, so I have just stuck with plain nonfat, although Kroger does have a Carb Master brand that I wouldn’t mind having every once in a while for some variety. I have been a little intimidated to try many “bars” because of their high sugar content, but I know in many cases (such as Larabar) it’s because they contain fruit, not necessarily added sugars. 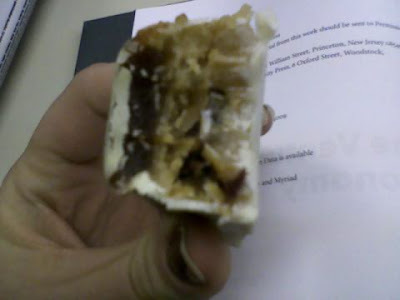 I have enjoyed the Pure Protein bars I have had, especially the Blueberry Crumb Cake and the Chocolate Peanut Butter. They do contain sugar alcohols though, so I have been careful not to eat too many of them, just incase. I have also become very aware of the sugar content in many of the foods I had been eating previously and this has helped me stay away from some of those “red flag” items (mostly baked goods and candy). I have also been sure to take a multi-vitamin every other day, just to be sure I am still getting all my essential vitamins and minerals where my diet might be lacking. I guess what I am trying to say is that even though I hate thinking in terms of “diets” and deprivation, this plan has helped me learn a few things, kick massive cravings and yet I have stayed full and really enjoyed the foods I am eating. I have even more energy now than I did before and I definitely have more awareness of what’s going into my body and confidence in myself. Anyway, I bought these Kashi Go Lean Original waffles last night when I stopped at the store to get drinks for our Monday Night Football group. This morning for breakfast, I toasted two up, spread 1 tbsp of peanut butter on them and heated up some turkey sausage on the side. Hope everyone enjoys their Tuesday…just think of what things will be like this time next week, with all the excitement over the Election! I will be glad to stop seeing (and hearing) all the negative commercials but I will miss the more exciting parts of this whole process once it’s over. Thank you so much for all the kind comments everyone! I really do appreciate it 🙂 This blogging community is so wonderful. 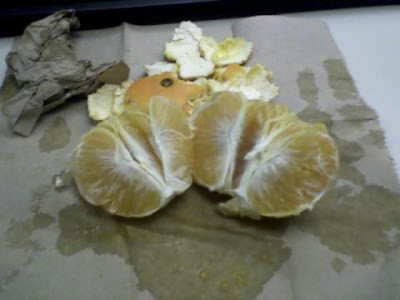 I ate a tangerine with this as well! It was so juicy and sweet 🙂 It really does pay to get fruit in season…it’s cheaper and it tastes better too. 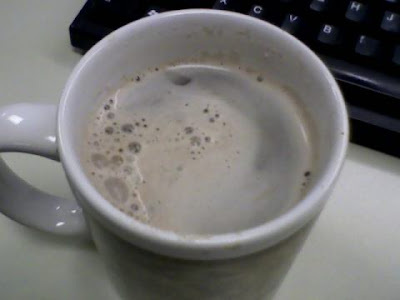 Later in the afternoon, I had a fat free hot cocoa (25 calories) to warm up, it’s still quite cold here, even today. But they are saying it should get better by the end of the week, yeah! 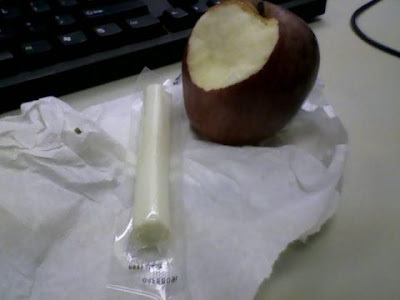 I knew I was getting some cardio at the end of the day, so I made sure to have a good snack before I left work…a red delicious apple (my favorite kind) and a light mozzarella cheese stick. This was a great snack and definitely good fuel for my cardio workout. So, my usual running partner canceled on me but I ended up going over to the gym and getting on the treadmill. I do prefer to walk and run outside but it was quite cold and I didn’t feel like bundling up and taking the risk of being overheated or not warm enough, etc. So I just threw on my usual gym clothes and hopped on! I feel really good about the workout I got. I just went 2.04 miles but for not being very consistent with my running lately, it felt good to do that much. I still can’t believe I’m the same girl who ran a half-marathon in April, not to mention a 5K, 10K and 10-miler in March. It just shows you what happens if you don’t keep it up! After burning some calories on the treadmill, I was way ready for dinner when I got home. 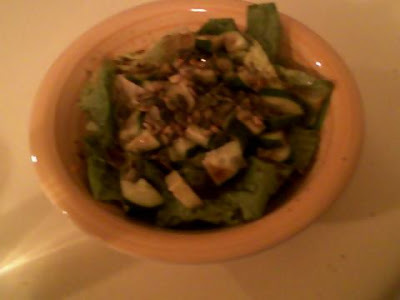 I made a salad with romaine lettuce, sunflower kernels, pumpkin seeds, chopped cucumber, and balsamic vinaigrette spray. I love the spray dressing because it lets you lightly coat the salad and not pour too much on there if you are like me and don’t like a lot of dressing. I saw at Target over the weekend that they have a ranch flavor, I wonder if that’s any good? Main course provided by my husband was chicken “tenders”…he is so sweet. After the naked tenders I had on Saturday from Buffalo Wild Wings, I was talking about how cool it would be to have those at home. 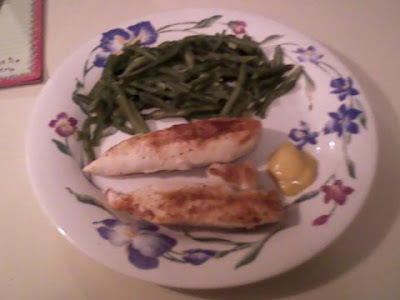 He grilled a regular piece of chicken on our George Foreman and cut it up so it would be almost like the tenders 😉 I also had french style green beans (from frozen) on the side and some mustard. I might’ve just been tired, but I thought the Monday Night Football game last night was incredibly boring! Luckily we had good company 😉 I also got to sit down for a while and ice my knees and shins which I’m sure saved me a lot of discomfort but I’m still sort of feeling it today. Not nearly as bad though and not really sore, just tender. Just 1-week to go until the big Election Day 🙂 Don’t forget to VOTE next week! 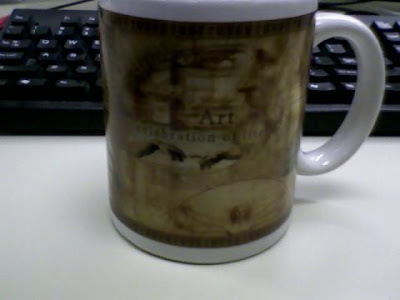 Behold my artsy mug…I have quite the collection as I have discovered from looking back through old blog pictures. 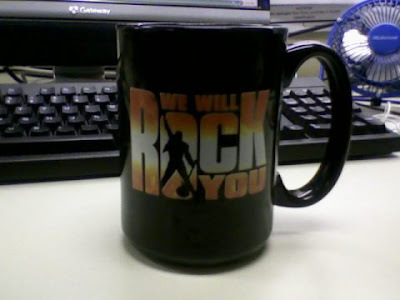 I might have to make a gallery of coffee cups or something, haha. 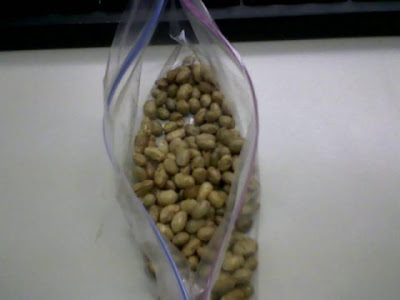 Mid-morning, I was starvin’ like marvin, so I threw back these unsalted soynuts, which I was afraid would not hold me, but they turned out to be quite the snack and good fuel too! Today’s workout was upper body and abs. I feel like I did good and I am slowly making progress. I may have to change up the exercises soon so I don’t get bored with this routine. I am supposed to be running after work but my partner might have to cancel on me, so we will see where I end up. I am going to do some sort of cardio after work though, I promise!